Its been said that on a Friday afternoon in Humboldt County, you do not even need a radio to hear the sounds of Reggae music. 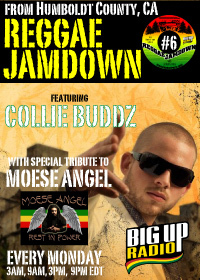 That is because a majority of the radios that are on, are tuned into the "Reggae Jamdown." For two hours, positive vibrations and a continuous mix of Roots, Dub, and Dancehall flow from the university campus to reggae lovers near and far via airwaves and internet. The "Reggae Jamdown" comes to BigUpRadio.com from the fertile hills and valleys of Northern California built on a tradition of community supported radio and an authentic love for Reggae music. Look forward to starting your week with big tunes from past, present, and future mixed by DJ Dub Cowboy and special guests.